On 21 November 2012, the fifth session of the Presidium of the Russian Orthodox Church’s Inter-Council Presence opened at the Throne Hall of the Patriarchal and Synodal residence in St Daniel’s Monastery under the chairmanship of His Holiness Patriarch Kirill of Moscow and All Russia. 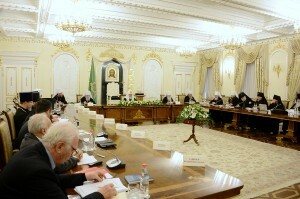 The Primate of the Russian Orthodox Church presented the agenda of the session. 27. Mr. Alexei Osipov, honorary professor of the Moscow Theological Academy.